I was born and raised in a high-desert Arizona mining town, where spirits rose and fell with the prices of copper. It was not high living, but it was a good life: I have tasted homemade chile verde right out of the pot, ridden atop a Trans-Am in front of the country’s last F. W. Woolworth’s, and held horned toads in my bare hands in the desert. You learn a lot about the very best and very worst in humankind when you live around cycles of poverty. I did. And that’s a blessing for someone who writes for a living. After years of working as a writer and editor in Charlotte, Seattle, San Antonio, Washington, D.C., and Madison, Wisconsin, I returned to my mother ship of Tucson in 2015. Here, I continue to write for magazines, marketing agencies, and my personal pleasure. Writing is my bread and butter but also my sugar and spice. I was a 2007 recipient of a Pushcart Prize Special Mention for literary nonfiction for my essay “A Year at the Lake,” which appeared in Brain, Child magazine and earned me a coveted panelist position in Miami’s “Big Read” citywide reading club.. My first book, After Birth: Unconventional Writings from the Mommylands (Possibilities Publishing, March 2013), debuted in the Top 100 in the motherhood category on Amazon. And my writing appears in the critically lauded anthology Listen to Your Mother: What She Said Then, What We’re Saying Now (Putnam, April 2015), a collection of essays that’s been recommended by Elle, Family Circle, Cosmopolitan, Good Housekeeping, Real Simple, Library Journal, Publisher’s Weekly, and Kirkus Reviews. In May of this year, I completed my second book. Speaking to the Mountain is a nonfiction work about the young rocket scientist who engineered the world’s first recreational wind tunnel just before suffering a spontaneous brain bleed that nearly killed him, erasing all but his most basic abilities. Unable to walk, talk, feed himself, dress himself or even show recognition of his wife and children, the engineer becomes the project. The book explores his unlikely recovery, from the viewpoint of his wife, and reveals the transformation of her evangelical beliefs as she comes to learn prayer is not currency, and faith is much different in practice than in theory. For the record, I do much more than literary writing: I was also the manager of the financial editing arm of the largest private investment-banking firm in the Pacific Northwest. I’m a former publications manager for the National Endowment for Democracy. I’ve produced news and commentary for radio and newspaper, and I spent many years writing, editing, and producing testing and educational materials for our nation’s schools. In addition, I provide professional blogging and website copywriting services. And now you know what I mean when I say I love writing in all its forms. To learn more about how I can provide writing or editing for your business, contact me today. 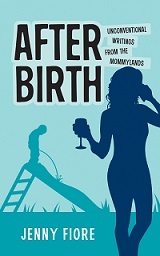 After Birth: Unconventional Writings from the Mommylands (Possibilities Press, 2013) debuted in the Kindle Top 100 in the parenting category and is available in Kindle and paperback formats. Click here to buy on Amazon.